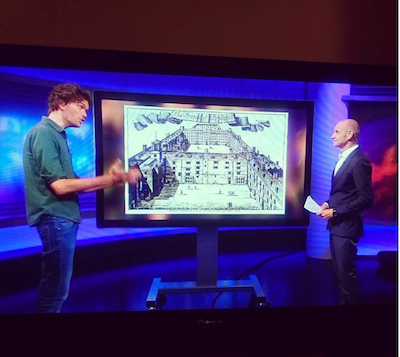 Following an article I’d written in the Guardian, I was summoned to Broadcasting House to talk Newsnight presenter Evan Davis through some the amazing buildings destroyed in the Great Fire – and some that survived, only to be demolished later. It was the first time I’d ever done live TV – and perhaps the fastest four minutes of my life. I loved every second of it. Evan is one of the nicest people you could possibly hope to meet, and all the producers and crew were incredibly friendly and helpful too.